‘Backless’ is a sensual masterpiece, at once enticing and faintly disturbing, titillating us with murmurs about “An opaque window of skin,” while breathing a dark undertone that runs through many of the poems, keeping us intrigued beyond the end.Memories are captured and shared, allowing us moments of uncanny intimacy and offering scenes of light and dark, beauty and ugliness on the turn of a heel. Some are breathtaking in the speed of their delivery, some gently wry, openly mocking, or contemplative. All are keenly-bladed, able to cut deep and leave their mark forever. ‘Oyster Forks’ is one of the most cunning, seeming at first glance to be no more than a list, an inventory of plates, cutlery, passengers, until you reach the end and realise that on this great ship, possibly the Titanic, there are 1,000 oyster forks, 1317 passenger ad only 20 lifeboats. It’s chilling in its simplicity. This brief poem sums up Samantha Wynne-Rhydderch’s skill – her ability to voice huge truths with immense clarity in the fewest words conceivable, leaving us deeply satisfied yet wanting more. 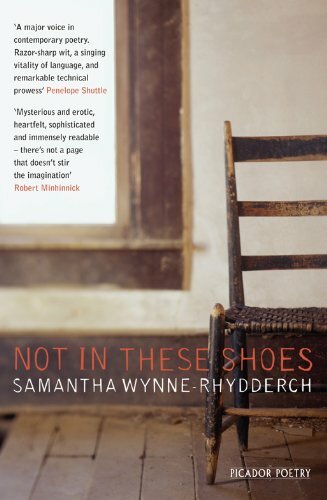 Not In These Shoes by Samantha Wynne-Rhydderch is available to buy from Amazon. I’m always happy to receive book reviews from guest posters. If you’d like to contribute, please email me at Judy(at)socket creative.com. This entry was posted in Reviews and tagged Book reviews, Not in These Shoes, Samantha Wynne-Rhydderch by Judy. Bookmark the permalink.